7th John Buckley Sports Graded T&F Meeting 2012 — St. Finbarr's A.C. 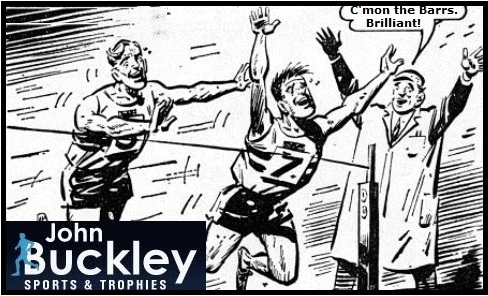 The 7th and penultimate John Buckley Sports Graded T&F Meeting of 2012 takes place on Saturday, August 11th, 2.30pm at the CIT Track. If you’re feeling inspired by events at London 2012, then here’s a chance for you to strike while the iron’s hot. Those guys Bolt and Rudisha make it all look so easy. I’ll bet you’re thinking, “I could do that if I put my mind to it”. Right then, let’s see you put in back to back 47s laps in the 800m. And let’s you demolish the field in the 100m while sucking your thumb and taking your foot off the pedal with 3m to go? Come along and show us how it’s done. The graded meetings are open to athletes of all levels of ability from any club. Entry is €5.00 on the day and you can do as many events as you like.